I'm experimenting with storing bookmarks in folders and using FARR to access the bookmarks rather than browser menus and toolbars. Recently I changed from Firefox to Chrome and I'm finding it a problem because Chrome has very limited support for multi-row bookmark tool bars. As I find using FARR to be quicker than using the mouse, it would seem sensible to rejig my system so that it is not dependent on the particular browser I'm using at any one time. So far, I have a search folder set up with "C:\FARR\URLs" as the path to be searched and (because FARR seemed to be searching in other areas as well) "+C:\FARR\URLs" in the restrictions box below. Finally I have an entry "uu uu = +uu" in the Quick Search Words box. This has all been a bit complex, and it's still not working quite as I would like. For instance, if I enter "uu news" FARR shows me a couple of the URL files from the "news" subfolder but it also shows as the first choice the built-in "news" alias as well as a "newegg" alias that is also apparently built-in. At the end of this list of five items it also shows the "news" subfolder, but if I select this it simply opens that subfolder in Explorer. What I would like FARR to do is show me (in a FARR list) the contents of the "news" subfolder straight away when I type "uu news" and the contents of other subfolders in the URL directory when I type e.g. "uu sport" and so on. Can anybody give me some pointers as to how I should achieve this? It should ONLY search that folder for files matching the term new and should not search any other directories at all. But you say you want it to show the entire contents of that directory when you search with no keywords, so instead what you could do is make an alias and use the restartsearch function to have it do a directory browsing/filtering. and have result of "restartsearch C:\FARR\URLs $$1"
Having said all that, another possibly MUCH EASIER way to do what you want is not to make separate shortcut files, but make one test file with all the urls you want, and put it in a text file and create a "us" alias that uses the "filecontents" command to let farr search it. Thank you for your helpful advice. First, the reason I want to use shortcut files is that I can simply drag and drop my bookmarks out of Firefox and into the folder to create them. That's a lot less work than making individual entries in a text file. Having said that, I have investigated the filecontents command and it does work well. It's just a lot more time to set up. On the subject of using an alias regex trigger, I cannot get it to work as you say should work. Typing "C:\Farr\URLs extra_keywords_here", such as "C:\Farr\URLs Emacs" does work as we would expect - additional keywords filter down the results and no results from other folders are included. So far, so reassuring. However, when I use the us(. *) approach it does not have the same effect, instead returning all kinds of files that are not related to the folder in question. My assumption is that I have set it up wrong, but looking at the following dialog I can't see what the problem is! You did exactly what I said do to but I mispoke -- the function you want to use is "dosearch" not "restartsearch". It's dosearch that will do the live display and filtering as you type. The function restartsearch only triggers when you hit enter. Thank you for that amendment. I have looked at the docs and that seems reasonable. So something is still wrong, but I can't see what it is. It doesn't look like the alias is actually triggering in your bottom screenshot..
Are you sure it's enabled? If so, try typing "us news" in the Test Regular Expression field of it just to make sure it's matching..
And here the results of typing "us news" in the Test Regular Expression field - nothing. I did try changing the alias trigger text to different strings, just in case there was some conflict somewhere with "us" but that did not help either. 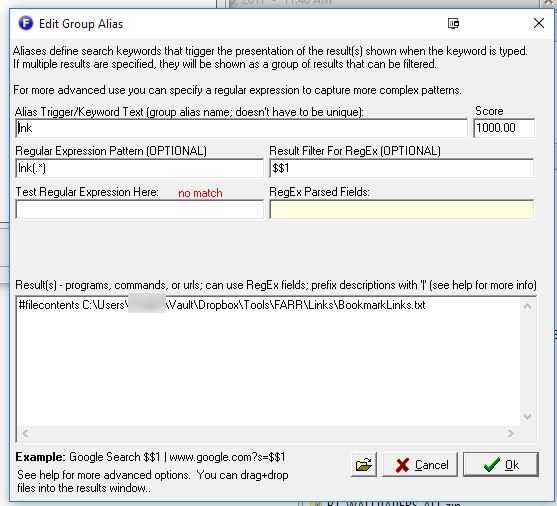 From looking at your screenshot of Test Regular Expression here, it's clear that expression is not matching. Ok you are putting the regular expression in the "Alias Trigger/Keyword Text" field -- but that's not where it goes. That's just for the NAME of the alias, or the first initial letters if you want to be able to search for it. The next field BELOW it is where you put the regular expression. That's why the "Test Regular Expression" is so useful -- it can help you verify that it's matching as expected. Note that I'm not sure whether you need the final \ at the end of C:\FARR\URLs\ or not. Sorted! Many thanks for all your help. Thanks for not giving up! if you have time, I have a follow-up question. I have been experimenting with the command mentioned above, but I cannot get it to work. In this case I have it bound to nn, as follows. I would expect that typing "nn emacs" would lead it to show a filtered list of all the entries extracted from the file using the filecontents command. Instead it just shows all the entries, without filtering at all (see below). I cannot work out what is going on. And yet I have a memory of it working a few days ago, so I think I have changed something but I don't know what. Thanks for this reminder. I really need to set up FARR to use the more powerful features, but always forget. I have a question now, trying to figure out this same thing - It shows the name of the file itself in the results, even though the location where the file is located is not in my search folders. What might I be doing wrong? Stupidity. I had a header in the file so I'd know which file I was using as I separate mine into categories with different keywords. Which brings me to a different question- is it possible to have comments in files that are overlooked when FARR searches? I can't remember specifically but I normally check for lines starting with // to indicate comments. if it doesn't work let me know and i'll add it.